Stitches taught in this kit: Satin stitch (kloster) blocks, solid motifs, cable and double cable stitch, Smyrna, three eyelet variations, cutting, woven bars, webs, corner to corner webs, spokes, picots, and large outer web. This is the first time I did spoke stitch and double cable. Once again I tried picots, failed once again, took them out, will try again on the next project. Each kit includes a lacy edged 20 count Lugana fabric for the bookmark, thread(s), size 22 and 24 tapestry needles, a needle threader, a color photo of the finished bookmark, chart, complete instructions and illustrations for each stitch. Thread supplied in this kit was Sullivans Overdyed perle Cotton #5 and size #8 ivory pearl cotton. I have forgotten the color name for this soft green varigrated #5 that came with the kit and I used a green size #8 from my stash in place of the supplied ivory size #8. 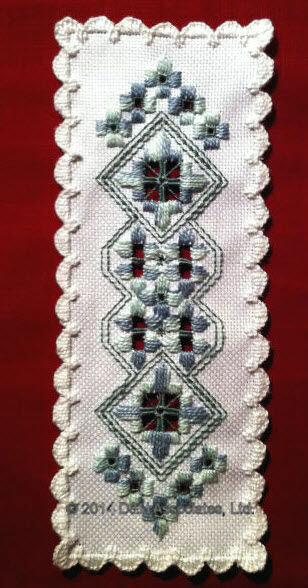 Approximate size of this bookmark is 8.5 inches by 3.5 inches. As I was working the inner part of this bookmark I saw a Stitching Fingers posting of a lovely hardanger and cross stitch rose runner. The scalloped edge caught my attention and so I decided to work this bookmark design on a scrap piece of handanger fabric. I was able to contact the stitcher and she was kind enough to share the edge’s stitch pattern with me. It took me over two days stitching away, even once taking near all the scalloped edge stitching out because … well, I just wasn’t happy with the tension of my stitches (I’m a little bit crazy).